Harmony, a primary five pupil was born to Protestant parents and was baptized in the same faith. He joined the baby class of our St. Benedict’s Grade School in 2005. It has been the school’s tradition to celebrate the Sacraments of Initiation during the feast of St. Benedict. 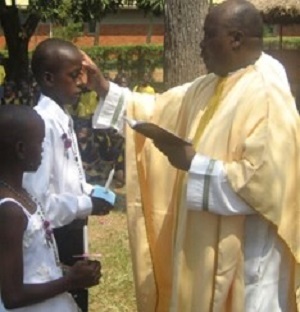 This year, there were 26 first communicants and 9 baptized pupils: one was a convert from Islam and two were Protestants. Harmony was one of them. Two seminarians helped in preparing the catechumens. Since the beginning of the catechesis, Harmony showed great diligence in his studies. He had great fears but with much trust in God’s providence and faithfulness. Before the final interview with the Parish Priest, we conducted an interview to check who was eligible for the first Holy Communion and Baptism. It was at this point when Harmony came to me and shared his worries and fears. He spoke with clarity and conviction of his resolve to be baptized. He told me, “Sr. Judette, I have a big problem. My mother will not allow me to become Catholic. Help me talk to her and to convince her. “ I asked him about his father’s sentiment, and he said he has no problem with his father. So, I decided to call his father first and expressed to him the child’s fears. The father told me that he will talk to his wife, and informed me afterwards that his wife simply said, “NO, NO, NO! It will never happen!” After I told Harmony about his mother’s reply, I told him to share his cares and concerns with Jesus. I decided to call the mother and asked her to come to school to tell her that the boy was in tears. The father also came and the three of us tried to convince Harmony to join the Protestant group for the preparation. But he told the father that he didn’t want this. He told his father as tears flowed, “I don’t want to, I want to be a Catholic and nothing else”. I was deeply touched by the boy’s response and my own tears softly rolled down my face. His passion for catholicism was incredibly moving for me. After two days, I received a call from the mother. She told me that she consents to Harmony’s baptism. I called the boy to give him the good news. When he heard it, he hugged me with tears of joy. For sure, it is the same torrent of tears that broke the hardened heart of his mother. Indeed, with God nothing is impossible.